The Medical Alley Association, led by its Board of Directors and executives from all sectors of the Medical Alley healthcare community, had the opportunity to sit down with DFL gubernatorial candidate, Congressman Tim Walz, to discuss the recent release of Medical Alley Association’s working group report, “Realizing the Vision: Medical Alley is the Global Epicenter of Health Innovation and Care.” The report is a blueprint identifies ways to for the public and privates sectors to work together and bring the knowledge, expertise, and experience from across healthcare to help address key public policy challenges. 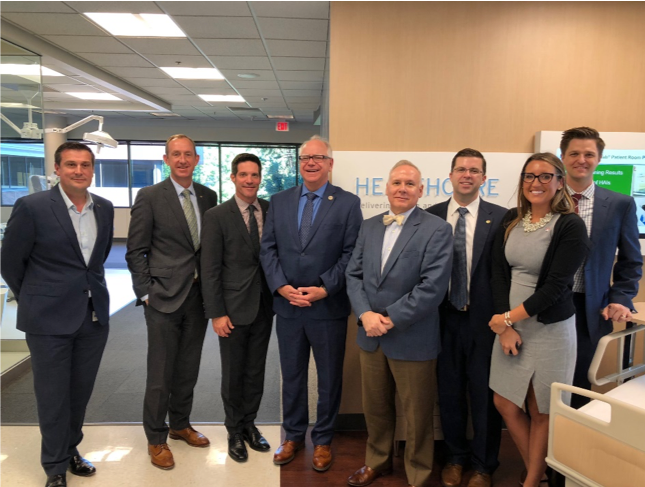 Thank you Congressman Walz for meeting with MAA Board members and discussing how we can work together to cement Medical Alley as the global epicenter of health innovation and care! Earlier this month Ecolab hosted Medical Alley Association and Minnesota Gubernatorial Candidate Congressman Tim Walz for a meeting and tour of their R&D Facility in Eagan. The tour focused on Ecolab’s Healthcare & Life Science division that serves hospitals, long term care providers, personal care & cosmetics and pharmaceutical markets. This division develops and delivers infection prevention solutions that improve cleanliness and operational efficiency, enabling the focus to remain on delivering quality patient care to improve outcomes. Thank you to Medical Alley Association Board Member and Ecolab’s Senior VP & General Manager of Global Healthcare Division, Paul Chaffin, and Ecolab’s VP of Research and Development, Pedro Van Hoecke, for showing us EcoLab’s innovative work that helps protect the places people eat, sleep, work, play and heal. This past summer HHS put forward a Request for Information (RFI) soliciting comments on a proposed workgroup to facilitate high-level dialogue between HHS leadership and those focused on investing and innovating in the healthcare industry. Medical Alley Association submitted a response to this RFI with a number of suggestions on how to structure the workgroup and the needed geographic/life-cycle balance, among others. You can read our full comment here. The DSIIS is designed to “produce high-level discussions between HHS and private sector innovators that will advance the mission of HHS to enhance and protect the health and well-being of all Americans.” Participants will provide their individual perspectives on a range of issues related to healthcare innovation and investment. The full press release, which details selection criteria for perspective participants and how to submit recommendations, is here. Medical Alley Association will keep you updated as this process continues and will be closely monitoring this workgroup’s activities. In early September, Medical Alley Association submitted formal comments in response to Requests for Information (RFI) from two different federal agencies. The first of these was to the Federal Communications Commission (FCC). They asked for thoughts on an effort to create a “Connected Care Pilot Program” designed to support the delivery of telehealth to low-income Americans. The early outline of this program indicates it would award $100 million worth of grants with the purpose of increasing the access and use of telehealth in rural, remote, and low-income areas. MAA focused its comments on innovative work being done in the telehealth and home monitoring areas in Medical Alley and why Minnesota would be an ideal grant recipient. Read the full comment here. The second comment touched on a portion of Center on Medicare & Medicaid Services’ (CMS) proposed revisions to the Medicare Program, specifically regarding the modernization of Medicare Physician Payments for services furnished via telehealth. MAA’s comments revolved around the continuous development of health technology, ensuring that any new regulations are ‘future-proof’ and that reimbursements need to reflect the provider’s commitment to telehealth by their investment in, and maintenance of, needed infrastructure. Read the full comment here. 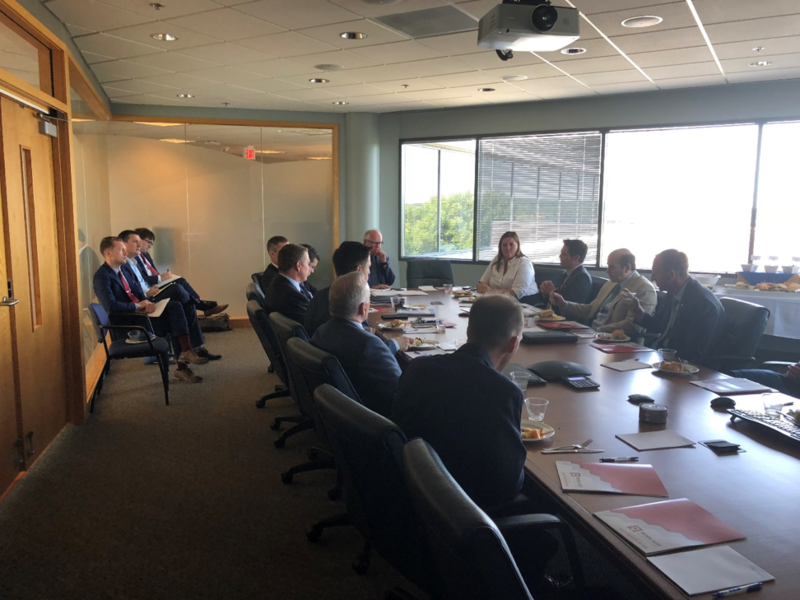 Minnesota is proud to host the U.S. Department of Health and Human Services on their multi-city tour to connect with local healthcare startup entrepreneurs. Representatives from the Food & Drug Administration (FDA), Centers for Medicare and Medicaid Services (CMS), National Institutes of Health (NIH), and other departments are excited to share insights on collaborating with their agencies and learn how they can support Minnesota startups. The University of Minnesota, Medical Alley Association, and Minnesota High Tech Association have planned an engaging day of speakers, panels, and business plan presentations to support the healthcare ecosystem and showcase Minnesota’s innovation.